A satellite dish is a powerfull signal booster when used in combination with a WiFi biquad antenna. I see lots of satellite dishes laying in trash when driving. Grab one next time you see an old dish laying on the sidewalk. I have tried using both smaller Dish Net dishes and larger 76cm (30 inch) dishes [Fig. 1]. They both work well. The larger dish will give you some extra gain but even the small one works really well. How far you can go with this booster? I have tested it up to 250m (820 feet) with Netgear router on the other end and it worked flawlessly. The router was using the stock antenna it came with. First disconnect the so called LNBF from the dish [Fig 2]. Then mount your biquad antenna in place of the LNBF. Ideally, it should be in the exact same position as this is the focal point of the parabolic dish. You can mount the “naked” biquad [Fig. 3] or place it in an enclosure first which will protect it from weather [Fig. 4]. The actual rigging method is something you’ll have to decide based on the materials you have. I tried mounting the antenna directly to the arm of the dish [Fig. 3]. This method works well but all exposed copper pieces will oxidize quickly. 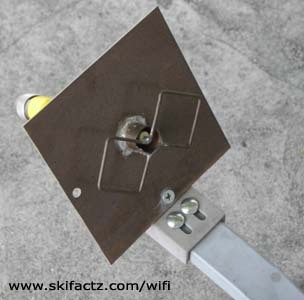 In addition, an exposed antenna can be easily damaged should the dish lose footing. A better way is to house the antenna in an enclosure and mount it using a support made of PVC electrical conduit pieces [Fig. 5]. 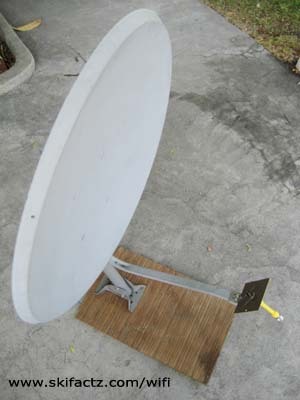 This method was useful on a Dish Net parabolic dish to elevate the position of the antenna. Dish Net dishes have a chunky LNBF that sits up high. Anything you can do to lift the position of your antenna and make it close to where LNBF sits will help. Make a provision to rotate the antenna 90 degrees [Fig 6]. The ability to rotate 90 degrees will allow you to match the polarization of the distant antenna you’re connecting to. All satellite dishes are designed to point up to the sky. Even when the dish is seemingly 90 degrees to the ground it is still looking up. To properly aim the beam you will need to point the dish down [Fig. 7]. If you are on a hill you will need to point down even more. Now it’s only a matter of fine tunning the position of the dish. Using a free tool like Netstumbler is a good way to aim your dish properly. Once you lock the maximum signal tighten the screws on the dish and rotate the antenna 90 degrees. 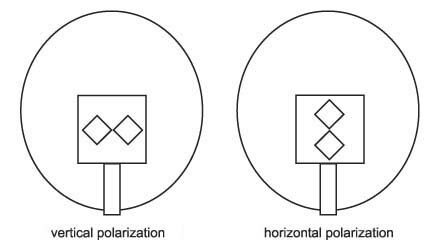 One of the two polarization positions will give you stronger reception. Securing the dish with bricks like I’m doing in this picture is a very bad idea. Winds can easily knock the dish down or lift it off your roof. Use something heavy to hold the dish down while locating a good spot to place it. Once you find the spot mount the dish permanently with heavy screws. Keep in mind that RF cable attenuates high frequency signal a lot. Keep the cable run at the absolute minimum or else all the signal gain of the antenna will be devoured by the cable. 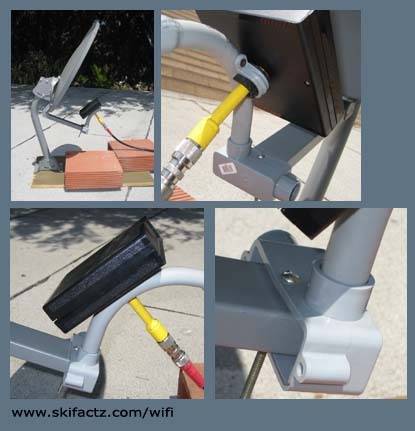 If you don’t have a proper WiFi directional antenna, you could try mounting a USB wireless adapter on the dish instead. Finally, there may be regulations determining maximum signal strength for 2.4GHz frequency in your country. In the United States FCC regulates such matters. It is not likely that FCC would take any action unless they receive interference complaints from people or business in your signal path. Also, this setup is fairly limited and without powerfull amplification you will probably not bother anyone. I’m not sure if I follow the question. Do you mean to say how do you hook the antenna up? The antenna has a RF connector on the back. You connect it with a cable to the other end which may be a WiFi adapter or a wireless router. i’m asking about the amplifier he’s talking about. When you reach a maximum distance of trying to make a connection you need an amplifier. The amp he is talking about has a female plug and i’m not sure if this is to connect to soemthing else or just to the coax cable. Hey, great tutorial; I have a question. I built a similar project from the many tutorials online (in my case a double biquad). I’m using it a little differently; what I’m trying to do is use it boost the signal of my own network, attaching it to my Linksys WRT 1900-AC. It doesn’t seem to work very well at the moment, and reading your tutorial it would seem that is because I am using the run of coax that came with the dish, which is very long, about 40-50′. So I obviously need to fix that. My question though is once I reduce the run, to use it as a TX antenna from the router rather than an RX antenna as it seems most people are using it, will I also need to amplify the signal as well? Or will I get the same results transmitting in terms of distance as most people get receiving? Impedance mismatch! TV cable is 75 ohm, use 50 ohm instead, and yes, the length is killing the signal before it reaches the antenna. That’s a good question Steve. But let me address the issue of the cable first. Not only you will need to shorten the cable run, but you will also need to get cable rated for 2.4 GHz frequency. This coaxial cable is very thick and expensive. How does satellite TV signal get inside the home with just the cheap coax cable? The receiving element on a dish called LNBF outputs the received signal to intermediate frequencies that common TV antenna cable can carry. Unfortunately, your passive WiFi biquad can’t do that. It can only feed very low power microwave signal into the cable. The signal attenuates very quickly even with the best cable. Now, regarding your question, you should get a better Tx with a parabolic reflector like a satellite TV dish than Rx of an access point of the same power that uses an omnidirectional antenna. The reason for this is that an omnidirectional antenna dissipates energy around the pole in all directions equally, whereas a parabolic dish reflects a more focused beam. The dish doesn’t create any more energy than there is. It just deflects it and sends it in a more narrow direction therefore saturating a smaller area with energy if you would. Help Please: I live in a remote area in the Himalayan mountains, Here we have very week mobile signals and we don’t have Internet. I read about satellite internet via dish antenna. I have a normal dish antenna of 6 feet, a digital receiver and webstar cable modem dpx100. My question is … is it possible to use free internet connecting this or is ther a way to use internet with my present equipment? or how can i use internet in this area? Halkal, unfortunately this article focuses on using a satellite dish in WiFi networks. These are local networks for use at home or an office. A dish can greatly extend a range of such network. What you’d need is a satellite based Internet service. This is an entirely different thing and it is not free. My smartphone picks up the WiFi from the local town cell tower. It’s free for the town. I am at the very edge of the towers capability, so I get a weak signal. The problem I have is that when I am not in the line of site (which is only in my driveway) I lose the signal. I want to be able to go inside and have the WiFi available. I have an old dish and it boosts the signal only when I place it in the driveway, but how do I get the signal to my smartphone?? You can get a router with wifi capabilities, research that, or try looking into a wifi extender or repeater or wifi hub. Good luck. Old thread I know. 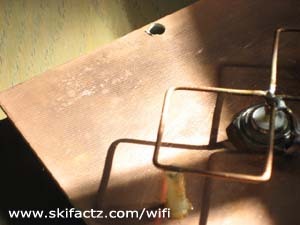 does a WiFi antenna send the signal to my phone? I don’t have a computer or a router. Just my phone. Does the WiFi antenna from the dish hook to my phone to get the WiFi signal?? James, without a repeater hard wired to your dish, there is little you can do to boost the free WiFi signal. If you were to aim the dish at the city’s WiFi antenna and place your smartphone in the focal point of the dish, it would reflect and focus the radio waves at the phone. Although this would help the reception, it is not very practical as you can imagine. Thanks. I had the dish in my lap with my arms wrapped around it holding the phone, and the signal was great, and would make for a silly youtube video “what strange things people will do for free WiFi. So I guess a repeater is the direction I must go. Thanks much. If you can get a signal to your cell phone. Why not set your cell phone up as a hot spot. Then you can leave it in place and connect to it with your computer while your nearby. Great article, Hakr. Working to help my neighbor. He is on DSL for internet, and everything in the house is fine–wired and wireless. However, he recently put up a large outbuilding about 150 from his house, and he didn’t drop an Ethernet cable when he was building the building, so we’re trying to figure out a more robust wireless set up. Currently, we have the Ethernet over Power out to the attached garage, with a router roughly pointed towards the outbuilding. At least we get signal there, but it’s inconsistent. Ideally, I’d like to build him a TX and RX using the dishes but need to know roughly what models/material to use. I am not sure that you even need a dish for 150 meters or feet. If you have the line of sight between the two points, just a regular wireless router should do. But the walls may attenuate the signal. If you have to use something as bulky as satellite dishes, any dish will do. Bigger the better, but in this application there is no relationship between the dish diameter and the radio frequency. The purpose of the dish is to focus the energy into the antenna. Instead of a biquad I’d try a USB wireless adapter on the receiving end. Unless you have a very short run of microwave antenna cable the signal will attenuate a lot. I think USB is more forgiving. Such USB adapter would have to be plugged into a computer. I don’t know if there is a ready-made option to connect a USB wireless network adapter into a wireless repeater. I’m here just to let you know that I’m about to craft my own WiFi dish. So, in a few days I will be back with some fedback. Thanks for the light given Hakr! I’m trying to do this too, I have a library a few blocks away, but not seeable I’d be great fun for any boost. My cell barely works in my house and I have 3 old dishes outside. Can you email me instructions, parts and all please..
HI MICHELLE. I’M AFRAID I DON’T HAVE ANY MORE INSTRUCTIONS THAN WHAT’S ALREADY AVAILABLE IN THIS AND OTHER POSTS ON MY SITE. If I use USB can I connect to wireless router inside so I can understand on my phone tablet etc? I’m working on a 3.85 KM link in Minnesota, using 2 Ubiquiti Nanostation M2’s. My accesspoint is 25′ off my roof, making it roughly 55 feet in the air. (maximum county zoning regulations, just above all the trees), and with this antenna I can see many signals! At the station point, Its about 30ish feet off the ground. The nanostation there is kinda hidden in trees.. which is bad news for the 802.11 protocol. I could barely see the signal at a -89 on the station end, not enough to hook (only worked in 8mhz, no other mhz would work, 10mhz and 20mhz is heavily congested by a local WISP). Took that antenna down last night and mounted a dish. It was so heavy 2 of us couldnt lift it back in the air!! Next tower day is a couple days out. Hoping the dish will send the Nanostations signal blasting through the trees, and to see the access points signal of hope from the station end!! Ill let you know if it works!! Any help or tips would be sweet though. Interesting project. I am 3 miles from one Sprint LTE/4G Tower/Antenna (and 3.5 miles from another) and the signal into my Network LTE 6100D gateway is spotty. The gateway uses two external antennas with MIMO technology. As I adjust the positioning on the gateway’s antennas, it changes back and forth from band 25 (1900 MHz) to 41 (2500 MHz). Today I ordered an outdoor 10dBi @ 800-900 MHz, 12dBi @ 1800MHz-2600MHz Omni-Directional LTE Antenna (2×2 MIMO) (6″ circle 4″ tall). I had intended on mounting it on my roof crest using a DirectTV dish mask and running dual 25′ of LMR-400 coaxial through my roof down into my office to the gateway. 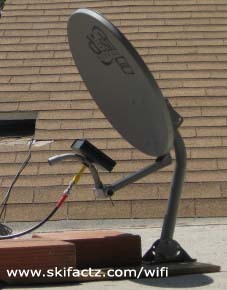 Since I also have the old DirectTV dish, what are your thoughts on mounting the MIMO antenna to the dish? After the antenna is built and placed what other components do I need? WiFi card? Repeater? I have no idea where the closest tower is. What is a repeater ?Where and what do I attach said”repeater” and wifi card to? I have an old desk top that I had running with an ATT wireless MiFi but when we got the smart phones I ditched the the mifi. Signals here are very poor regardless. Does the antenna have to be outside or could I put it in the attic to shorten the coax ? Thanks for all the info. PLACING THE ANTENNA IN THE ATTIC WOULD REDUCE THE SIGNAL LEVEL. How can I add a wifi antenna? But I want to use my Direct TV service, too. Can satelitte perform both tasks. It could perform both tasks in theory. However, a DirecTV satellite won’t be colocated with the WiFi access point you want to connect to. In other words, you can either point the dish to the sky or to the distant WiFi router, but not both at the same time. You may be able to mount it in the attic. It depends on the roofing material. I suspect that a metal roof may block the signal more than non-metal materials. The thicker the cable the better. For a long run I’d use a USB WiFi adapter and run a USB cable. The maximum USB cable length is 5 meters, but there are inexpensive extenders you could use. I would move the router to the attic and run CAT 5 or 6 cable down to the house and connect that end to another wireless access point. Keep the antenna cables as short as possible. 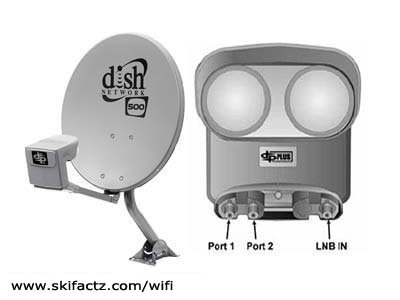 Some of my friends use to use the whole dish network dish with the Lnb hooked to rg6 cable Were talking the real old dish network dish and lnb the singal headed ones. Not sure how they relayed it. Any ideas email me back. How should I configure my Linksys wrt54g router once I connect the pigtale coax cable to it from the biquad antenna? Sir I live 17km away from city where there is free public wireless. I would like to get connected to this free wireless.Which tools should I buy so as to be able to access that wireless?